This Kit is designed as a building block in other projects where a battery-powered, variable-gain audio amplifier is required. Up to 2W. 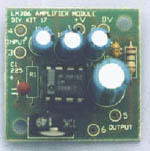 A 1W power amplifier building block designed to be part of a larger project needing a low power battery operated amplifier into an 8 ohm speaker. 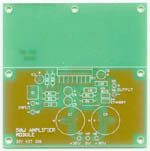 Using amplifier modules is modern, quick and easy but it teaches nothing about how they work. Here is a Class AB amplifier made from individual components which will deliver several watts of power into an ordinary 8 ohm speaker. Gives hands-on learning about cross-over distortion, bootstrapping, complementary pairs, and push-pull. Detailed explanations given. A simple, low cost stereo VU meter. Two LM3915 dot/bar display driver ICs are used to drive 2 rows of 10 LEDs (14 green, 6 red) in a moving bar display. Each row of LEDs spans a power range of 0-30 dB in ten 3-dB steps. This VU meter indicates "peak music power" when used with audio amplifiers. Ideal add-on for any of the amplifier kits. Dimensions = 65mm x 42mm. using the LM380. The IC solders directly to the PCB so no heatsink is required. 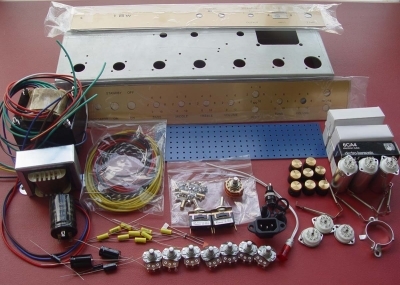 Contains all components to make a tone control & pre-amplifier unit. Signal processing is done in the TFS1524A by voltage controller amplifiers and filters. 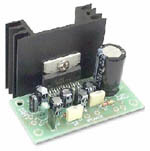 12V-15VDC supply. 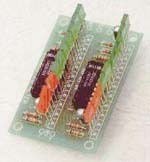 Single-sided PCB. Off/on switch in potentiometer. 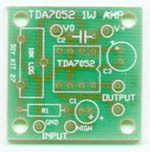 The TDA7294 monolithic IC is at the heart of this 50W amplifier module from ST Electronics. 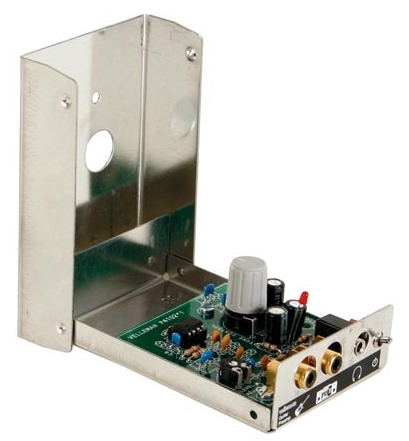 It is intended for use as an audio class AB amplifier in hi-fi applications. + / - 30V supply needed. Important: the user must supply a heatsink rated at 1.4 deg C / W. All components supplied. 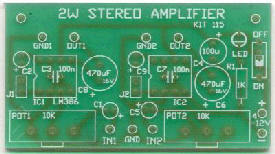 Uses 2 LM386N-1 for a stereo amplifier. Ideal for Walkman and other battery powered items. 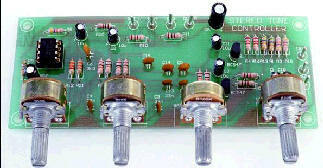 4V - 12V DC. K139 Kit 139 1W Stereo Amplifier Module with DC Volume Control. TDA7053A. 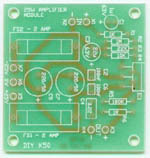 We spent alot of time getting the tracks right on this single sided PCB to get the lowest possible THD. Getting the separate tracks to the earth pin is the secret. We tried to do a mono version using the same chip but we could not get the THD to acceptable levels so we cancelled it. This power amplifier is an ideal set-up for active speaker use. Build a high-quality system, using two (stereo) or more (surround) amplifiers. Due to its auto switch-on, through input signal sensing, the unit can be installed at almost any place. Comes complete with enclosure and transformer. PCB dimensions: 105 x 70mm / 4,1 x 2,75"
PCB dimensions: 1.2" x 1.7"
Robust : Overload and short-circuit protection, protection against incorrect power supply polarity and thermally protected too. Speaker transient suppression. short-circuit and overload protection: max. 10 sec. power supply: + 28V DC and - 28V DC max. consumption (2 x 4ohm or mono-bridge 8ohm): 4A max. consumption (2 x 8ohm): 2.5A max. 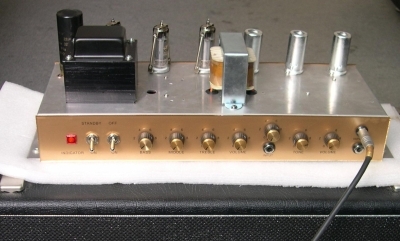 dimensions: 8.3" x 3.4" x 2.5"
dimensions: 13.8" x 2.5" x 3.4"
For most of us a high power tube amplifier is unaffordable. This kit changes that, so that now everybody can enjoy that sublime "tube sound". The sound of tubes has never been surpassed, nor by transistors, nor by FETs. In the course of developing this amplifier, special attention was given to the housing so that the expensive tubes are on display in a way that is very pleasing to the eye. The weakest point of an tube amplifier are the output transformers ; that's the reason why we use ultra-linear and over-rated output transformers (toroidal) to guarantee a rich bass response. To extend the life of the precious valves, the amplifier is provided with an switch on delay, so that the high voltage is switched on when the tubes are warmed up. dimensions: 16.7" x 5.1" x 13.8"
dimensions: 2.8" x 1.2" x 4.1"
Plenty of power, deep bass and low distortion, yet still affordable. This single channel tube amp delivers up to 65W of pure class A power, due to its KT88 output penthodes. A attractive chrome plated enclosure has been designed, to match this state-of-the-art design. It comes complete with chrome plated tube base cover rings and heavy duty cabinet feet. dimensions: 14.2" x 14.2" x 6.3"
Upgrade your guitar amp, jukebox or construct your own audio system with this superb tube amplifier module. Plenty of power, very low distortion, excellent bass response, this amp will satisfy even the most critical listener. It comes complete with PCB, toroidal custom made power and output transformers, all necessary tubes and an extensive manual. assembled module dimensions: 12.6" x 13.6" x 5.0"
dimensions: 11.4" x 6.5" x 2.7"